Acceptance and commitment therapy (ACT) is proven effective in the treatment of an array of disorders, including addiction, depression, anxiety, self-harm, eating disorders, and more. Evidence shows that mindfulness and acceptance exercises help clients connect with the moment, uncover their true values, and commit to positive change. But did you know that compassion focused exercises can also greatly increase clients' psychological flexibility? More and more, therapists are finding that the act of compassion—both towards oneself and towards others—can lead to greater emotional and physical well-being, increased distress tolerance, and a broader range of effective responses to stressful situations. One of the best advantages of compassion focused methods is how easily they can be integrated into an ACT approach. 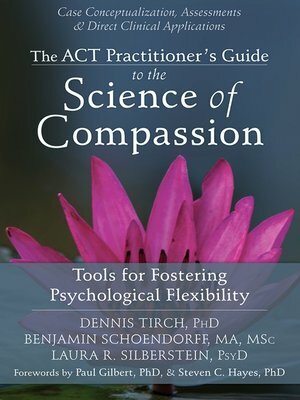 An important addition to any ACT professional's library, The ACT Practitioner's Guide to the Science of Compassion explores the emotionally healing benefits of compassion focused practices when applied to traditional acceptance and commitment therapy (ACT). This book offers case conceptualization, assessments, and direct clinical applications that integrate ACT, functional analytic psychotherapy, and compassion focused therapy to enhance your clinical practice. This is the first book on the market to provide an in-depth discussion of compassion in the context of ACT and other behavioral sciences. The integrative treatment model in this book provides powerful transdiagnostic tools and processes that will essentially build bridges across therapies. If you are ready for a new, easily integrated range of techniques that can be used for a variety of treatment applications, this guide will prove highly useful. And if you are looking to build on your previous experience with cognitive and behavioral therapies, this book will help to enhance your treatment sessions with clients and increase their psychological flexibility. Paul Gilbert, PhD, is world-renowned for his work on depression, shame, and self-criticism. He is head of the mental health research unit at the University of Derby and author of The Compassionate Mind and Overcoming Depression.